On January 19, 1809, a couple of impoverished actors in Boston, Massachusetts welcomed their second son, Edgar. By the time he was two years old, his father had abandoned the family and his mother died of tuberculosis, effectively orphaning Edgar and his older brother and younger sister. The children were separated and raised by different families. Edgar was sent to Richmond, Virginia, where he lived with the Allan family, who—though they never formally adopted him—gave him their name when he was baptized. Haunted by tragedy, he would, himself, die tragically young but, in the four decades he walked this planet, he managed to sculpt that tragedy into some of the most influential poems and short stories ever committed to the page by an author from the United States. 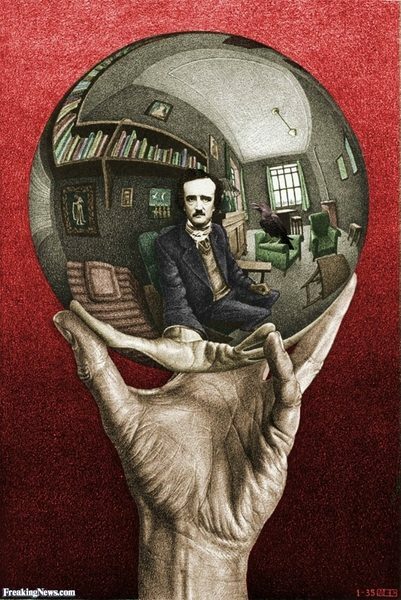 Today marks the two-hundred and ninth birthday of Edgar Allan Poe, prolific poet, literary critic, early/proto-science fiction author, progenitor of mystery/detective fiction, and one of the founders of the Gothic horror genre. Many of his works are so influential that their themes have become ubiquitous, saturating popular culture: how many television shows and films have you seen featuring a storyline about a guilty conscious manifesting to haunt a character in the physical world a la The Tell-Tale Heart? Squeaky squeak, Mr. Krabs. Squeaky squeak. So much of the information about Poe that has embedded itself in popular culture has turned out to be exaggerations of the truth or outright falsehoods. For the longest time, there existed only one “biographer” of the author—Rufus Griswold. Griswold and Poe were longtime frenemies and, after Poe’s early and mysterious death, Griswold “cleverly manipulated and invented details of Poe’s life for the least favorable account he could create,” even going so far as to forge letters from the deceased that would bolster his own invented narrative. It is thanks to Griswold that Poe is widely accepted to have been a drunk, a drug addict, a man prone to madness and baseness. More recent scientific analyses and biographical studies have shown that he did not do drugs and he had joined the temperance movement and become a teetotaler. That is not to say that Poe was a saint. He did have intermittent issues with alcohol, that’s what prompted him to make that temperance pledge in the first place. He had gambling debts that followed him in his youth and early adulthood and his debts ultimately cost him his relationship with his foster father. He got himself court-martialed in order to get out of West Point. 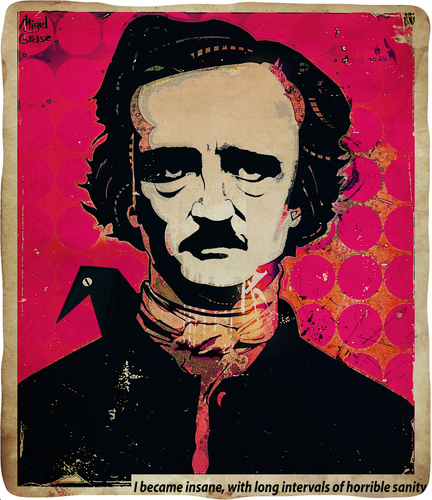 While, at the time, it was not necessarily uncommon for relations to wed or for teenaged girls to be married off, Poe married his first cousin who was only thirteen, which thoroughly creeps out a lot of modern readers; though, his motivation for doing so varies widely depending on who is providing the account. Whether it was consummated or not, he did have a rather public affair with poet Fanny Osgood. And though he was a skillful literary critic, he could be so acerbic that it was remarked that, “he seems sometimes to mistake his phial of prussic-acid for his inkstand;” his cutting critiques earned him no shortage of literary enemies, including his character assassin, Rufus Griswold. Let’s also not forget that he was a white dude in the early 1800s—raised by a Virginian businessman, at that—there’s no way he wasn’t a patriarchal white supremacist (or, at best, he was willing to deploy a lot of racist and misogynistic tropes, which …ummm… still makes him racist and misogynistic), however gentlemanly he may have presented his beliefs. Poe just really didn’t dig following orders if they no longer suited his long-term plans. Nevertheless, despite his actual flaws and his rumored ones, he did manage to persevere through tragedy after tragedy, hardship after hardship (some of which were, admittedly, self-inflicted) and leave an indelible mark on literature and other forms of storytelling, especially with his exploration of horrors and his pioneering the detective/mystery genre. 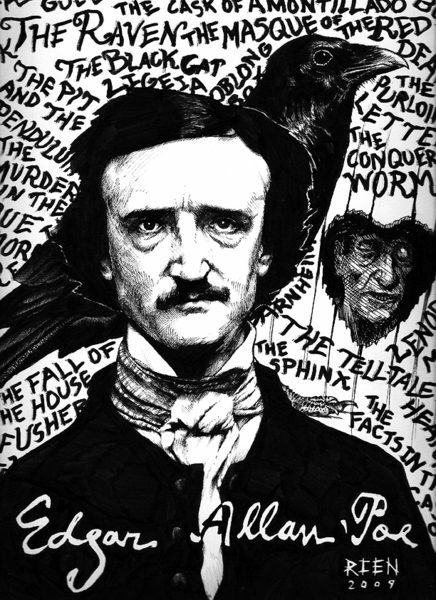 Those horrors and mysteries did not confine themselves to ink on paper, though; instead, they leapt from the page and enveloped Poe in his death. After leaving Richmond for Philadelphia, Poe vanished for nearly a week and was found in a barely conscious stupor in Baltimore, wearing ill-fitting and tattered clothes that did not belong to him. He was taken to a hospital, where he died four days later. At no point during the time from his being discovered in Baltimore and his death did he remain coherent long enough to explain what happened to him. Theories attempting to explain his death—aside from the false accusation that he basically drank himself to death in a gutter—have ranged from cooping to a brain tumor, from cholera to rabies. To this day, we have no definitive cause of death for the legendary author, just some guesses that are better scientifically supported than others.